Orthodontists are specialists in the diagnosis, prevention, and treatment of jaw, face, and bite irregularities. They blend artistry with oral health care to help patients achieve more aesthetically pleasing smiles and improve their overall oral health. At Dr. Deza’s Dental Office, Dr. Rocio Deza collaborates with an orthodontist to help patients in Moreno Valley achieve near perfect smiles through thoughtfully planned treatment. Whether you’re an adult looking for discreet ceramic braces or a youth wanting to express your individuality through an array of colored ligatures, we have numerous options available. Offering a combination of multi-phase solutions, such as spacers, head gear, and retailers, as well as a variety of choices for braces, our goal is to give you the positive oral health you need and the attractive dental appearance you've always wanted. Why do Patients Seek Orthodontic Treatment? During your consult, Dr. Deza will discuss the treatment types best suited to your unique situation and, together, we'll come up with the right solution to resolve your concerns. What Types of Braces are Available at Dr. Deza's Dental Office? Metal Braces – These are the traditional type of braces that you most commonly see patients wearing. Made of surgical quality stainless steel, these braces are comfortable to wear and are a reliable treatment option. Ceramic (clear) Braces – Ceramic braces have the same structure as traditional metal braces, but are made of a material that more closely resembles the translucency of naturally healthy teeth, allowing them to blend easily. 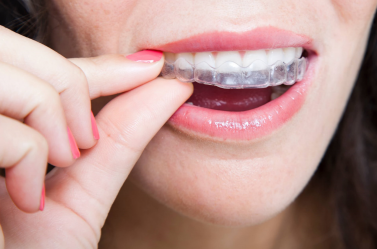 Invisalign® Clear Aligners – The most well-recognized clear aligner therapy, treatment with Invisalign consists of a custom set of clear plastic aligners that gradually move a patient’s teeth along a predetermined timeline. These are the most discreet option and are a great approach for patients who only have minor adjustments that need to be made. Schedule an Orthodontic Consultation Today! If you’ve been dealing with bite issues, want to prevent your teens from developing jaw issues, or simply want a straighter smile, call to schedule a consultation for orthodontic treatment at our Moreno Valley dental office today.